Here’s the answer: KIRBY FORGOT. That sounds reasonable. I mean, it’s certainly not because Kirby was producing something like 16 pages a week with little to no editorial oversight, and either forgot or changed his mind or simply didn’t give a good goddam about Teekl’s gender. Why, the very suggestion is absurd. 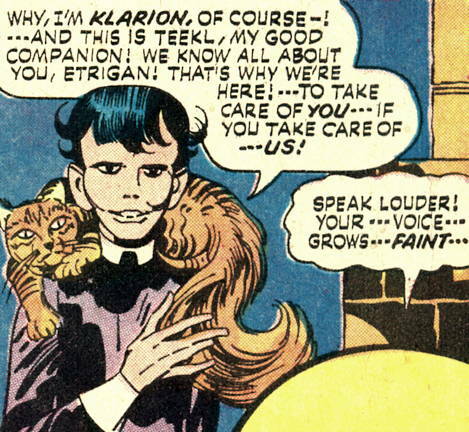 Of every funny book I read from the ages of 8 to 11, nothing came close to terrifying me as much as Klarion and Teekl. That book scared the BEJEEZUS out of me. I’m glad I didn’t catch the gender-changing issue back then because my pre-adolescent mind would have exploded. Krazy Kat’s gender was pretty changeable, too, if I’ve been reading it right. Though Krazy Kat has never been as freaky as those few Kirby panels. think the reason Teekels gender kept changing is one Kirby always had a bad memory so he proably forgot a few times the gender Teekel is suppose to be plus Teekel being a magic creature gives he she the ability to change genders if the writer chooses . 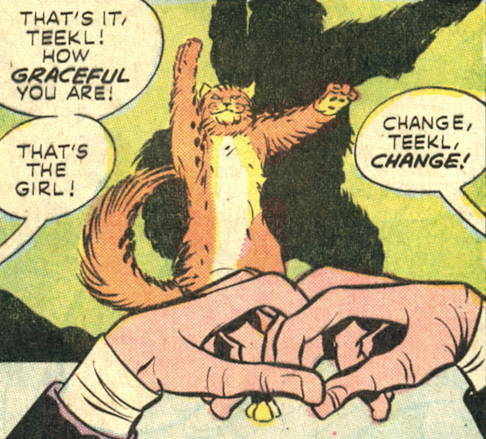 after all the doom patrol had changing genders with REibus so Teekel changing gender should just be do to he she being magic and choosing what ever gender Teekel chooses to be. C’mon, Jack couldn’t remember how many fingers the Thing had from page to page; his mind was focused on bigger subjects. You think he’s going to let something like a cat’s gender distract him? 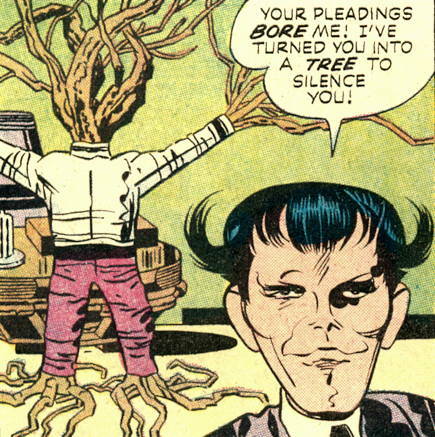 I thot I’d seen every impressive Kirby panel out there (and, man, there are a lot of them) but “I’ve turned you into a tree…” is one of his best. 3rd panel above: Holy Moley, Teekl was Death Cat before there was a Death Cat. 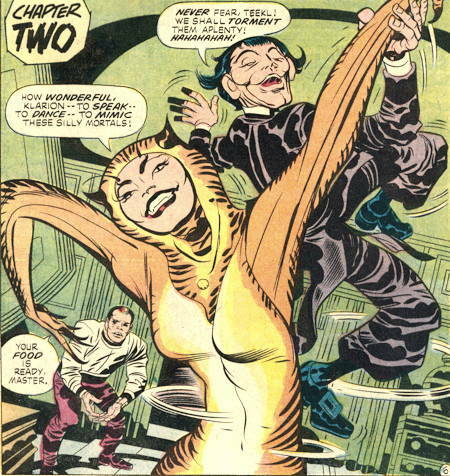 that is one creepy looking cat.ah, the weirdness and majesty of Jack Kirby. I’d like to smack that smirk off Klarion’s face. His face. Dear God, HIS FACE! Not aware of the controversy although I have read the first two Demon/Klarion team-ups, but years apart. Fascinating. Did a post about Kirby costumes with emphasis on the Demon/Klarion team on Mystery Hoard awhile back. I quite liked Morrison’s updating of Klarion’s origins and the Solomon Grundy tie-in. it would appear that Kirby invented “furries”. Dude, didn’t you get the memo? Kirby invented EVERYTHING.